The tan Good Neighbor® Vinyl privacy fence is available in heights of 3', 3.5', 4', 5', and 6', and is also available in khaki or white. The solid portion of this fence is also available in greystone, stained cedarcrest and cedarcrest. 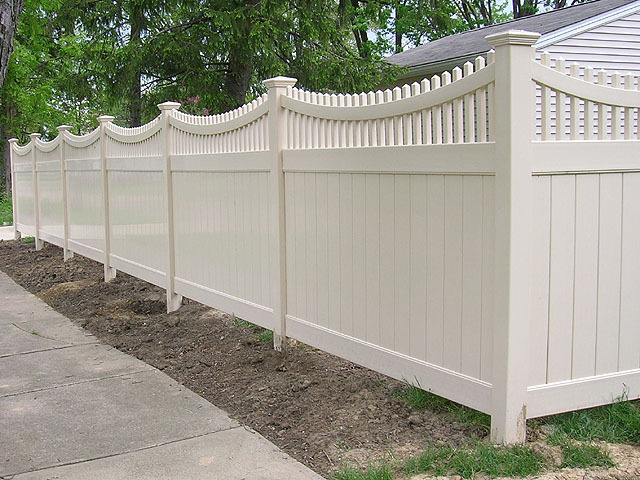 The tan Vinyl Good Neighbor®Privacy Fence With Scalloped 1 3/8x1 3/8 Top is available in sections up to eight feet long. There are a variety of vinyl manufactures. As a company we thoroughly researched the majority, and feel extremely confident in our manufacturer, Plygem (aka Kroy Building Products). They provide a product that we are pleased to hang our company sign on. Our manufacturer also provides a lifetime warranty. Please note, however, that vinyl will not work in every situation. It will not provide the strength and durability that is offered in a wood or ornamental steel fence. It is only maintenance free in terms of the painting. For a more objective look on a few of the popular brands of vinyl currently on the market, take a look at this blog by clicking here. Don't be fooled by our name - Elyria Fence has been pleased to offer ourVinyl Privacy Fences, for installation in the following Ohio cities for 84 years: Akron, Amherst, Ashland, Avon, Avon Lake, Bainbridge, Bath, Bay Village, Beachwood, Bedford Heights, Bellevue, Berea, Berlin Heights, Birmingham, Bratenahl, Brecksville, Broadview Heights, Brooklyn/Old Brooklyn, Brookpark, Brunswick, Carlisle Township, Catawba, Cleveland, Cleveland Heights, Clyde, Columbia Station, Cuyahoga Falls, East Cleveland, Eaton, Elyria, , Fairview Park, Fairlawn, Garfield Heights, Gates Mills, Grafton, Hinckley, Huron, Hudson, Independence, Kelly's Island, Kipton, LaGrange, Lakeside Marblehead, Lakewood, LaPorte, Litchfield, Lodi, Lorain, Lyndhurst, Macedonia, Maple Heights, Medina, Milan, New London, New Russia Township, North Olmsted, North Ridgeville, North Royalton, Norwalk, Oberlin, Ohio City, Olmsted Falls, Parma, Penfield Township, Peninsula, Pepper Pike, Pittsfield, Polk, Port Clinton, Put-In-Bay, Remindersville, , Rittman, Rochester, Rocky River, Russell, Sagamore Hills, Salem, Sandusky, Seville, Shaker Heights, Sheffield, Sheffield Lake, Sheffield Township, Sheffield Village, Solon, South Amherst, South , Spencer, Strongsville, Tremont, University Heights, Valley City, Valley View, Vermilion, Wakeman, Wellington, Westlake, West Salem.